A few months ago on a podcast that I listen to, one of the guests had a rant about some of the crappy films she saw on the horizon. Chief among them was this Meryl Streep starring vehicle. Based only on the trailer the podcast guest dismissed it as Oscar bait not worthy of even thinking about. Now I have never been put off by the fact that someone has an opinion, but it seemed a bit harsh at the time, even though the film did not strike me as something I felt I must see. I understand the sentiment, after all it does look like it is this years entry in the Streep slot for an Academy Award. The movie does come from director Steven Frears who has often been associated with some highbrow films that look like they are seeking attention, the thing is though, they usually deserve the attention. This film is no exception. Had I listened to the advise of this blogger/critic I might have skipped over this film, as it is, that would have been a mistake. This movie has a lot going for it, especially the heart of the story which is very well told and entertaining as heck. Let’s start with the elephant in the room, the star. We know that Meryl Streep can sing. “Ricki and the Flash“, “Into the Woods” and “Mama Mia” have established that. 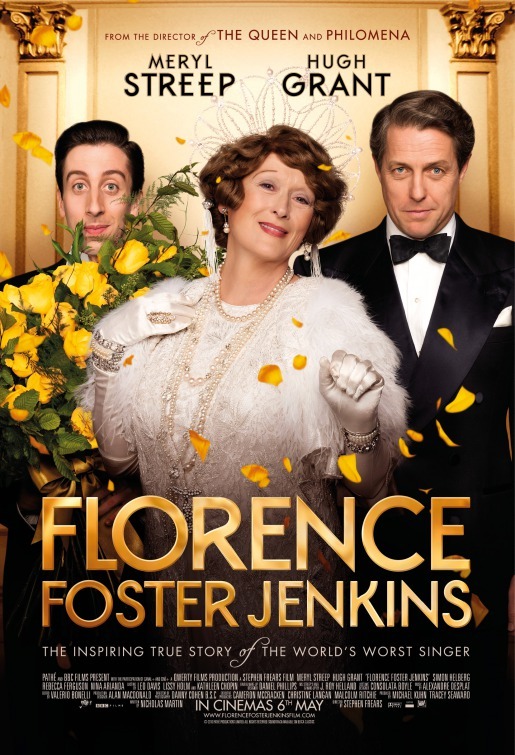 So in a sense this film is the real acting challenge because Florence Foster Jenkins apparently could not sing. Streep is very convincing as the music lover with flat pitch and sight blinded by desire. 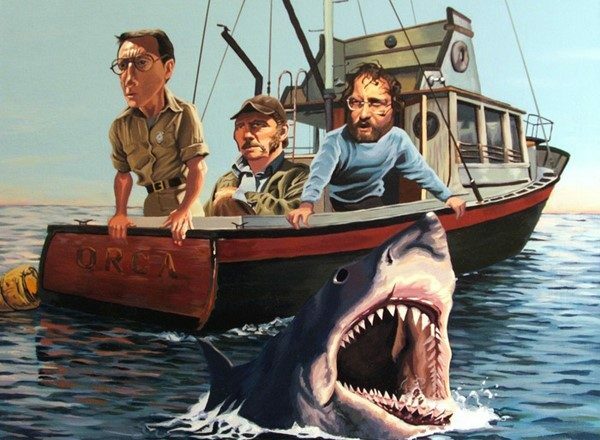 It appears that much of the story here is true although substantially adapted to make a comedic-drama work on film. Maybe some of you will be familiar with the story of Mrs. Miller, an amateur singer who had success as a novelty recording artist in the 1960s. “Florence Foster Jenkins was her progenitor. The real strength of the film however in in the performance of Hugh Grant, who reportedly came out of semi-retirement to work with Streep. As Jenkins husband St Clair Bayfield, he is his usual foppish English type but with a great deal of heart and wherewithal . At one point in the story it appears he is a cad, but as the film unwinds we learn that love is not always the thing that we define it as. Notorious for mugging on camera, Grant is more realistic in his facial expressions and more tender in his vocalizations than you have probably seen before. I have always been a fan of his but not necessarily because his acting was excellent but because he was well cast and charming. Today he impressed me as a thespian and I’m sorry to say that a film like this will generate more critical attention for the leading lady than for the gentleman. Simon Helberg, from “The Big Bang Theory” is much more the traditional comic relief. As Cosmé McMoon, her pianist accompanist, he gets several chances to visualize the absurdity of what is passing for music. His performance is much quieter than you will see in the television series and there is more substance to it. One of the things that this movie does is imbue it’s characters with real heart and Helberg has several scenes where his performance adds immeasurably to our acceptance of what is happening. Actress Nina Arianda is not a person I was familiar with, but she puts a lot of gusto in her role as Agnes Stark. She is a character that you might quickly dislike, but in the end she becomes a interesting champion for the music lovers that turn a deaf ear to our tone deaf heroine. Maybe one of the reasons the film works for me is the setting. NYC in the period of WWII is maybe the most romantic time I can think of in American History. The modern aesthetic of clothes, architecture, music and culture are seemingly so perfectly balanced at this point. Any time perion that we ourselves have not lived through can be made to seem romantic, and the taxicabs, concert halls and dining rooms of hotels all look great in the set design of this movie. I know that Liverpool stood in for the streets of New York in several scenes, and that might seem odd except that Liverpool has sustained the look of that time period whereas NY has moved on, so in the end it works quite well. Another reason I find the story compelling may be an addition made by screenwriter Nicholas Martin. In the film, one of the things that motivates Florence Foster Jenkins is her sympathy for American Servicemen during the war. As the character quotes Beethoven at one point “Wrong notes are of little consequence, but to play without passion is inexcusable”, Florence Foster Jenkins represents the kind of passion, for music and in the one case in the film, the military, that makes Beethoven’s reported words real. I am surprised as anyone at how much I enjoyed this film. I know I never had any hipster cred to lose anyway, but I suppose now my application for official hipster status will be automatically rejected in the future. I thought this was a sentimental and warm story, told with a great deal of humor and excellent performances from the leads. The movie looks grand and the director moves it along quite well without necessarily showing off. I’m glad to say that I “passionately” endorse this film, regardless of what my expectations might have been. Now I want to see this. Thanks, Richard. I’m sure you will like it.